Finding the military service record for an ancestor can be a great source of satisfaction……or not. Seeing your ancestor labelled as a ‘deserter’ can be a shock but often it just means that they did not return to Italy when called for military service from whichever country they had emigrated to. Refusing to serve meant never returning home again, something most Italian emigrants hoped to achieve one day. The Foglio Matricolare also details any injuries or death and where they are buried. A male child is entered into the ‘lista di leva at birth and called to serve at age 21. He serves a period of time and is then sent into ‘congedo illimitato’ which essentially means he can go home but is on call for the rest of his active life. Some of you will see your ancestor serving in both the first and then the second world wars. Being exempted means that your ancestor may be found in the Lista di Leva but there may not be a Foglio Matricolare for him. 4-Firstborn orphan son of both parents, or the only male who can work to support a family of orphans. 5-Inscribed in the same list of Leva with a brother born in the same year and who is not serving in the military. 10-Having a brother who died while he was on leave due to service-infirmities or injuries. As you can see in the attached list of exclusions, even having lost an ear or missing teeth could exclude you from military service in 1810. 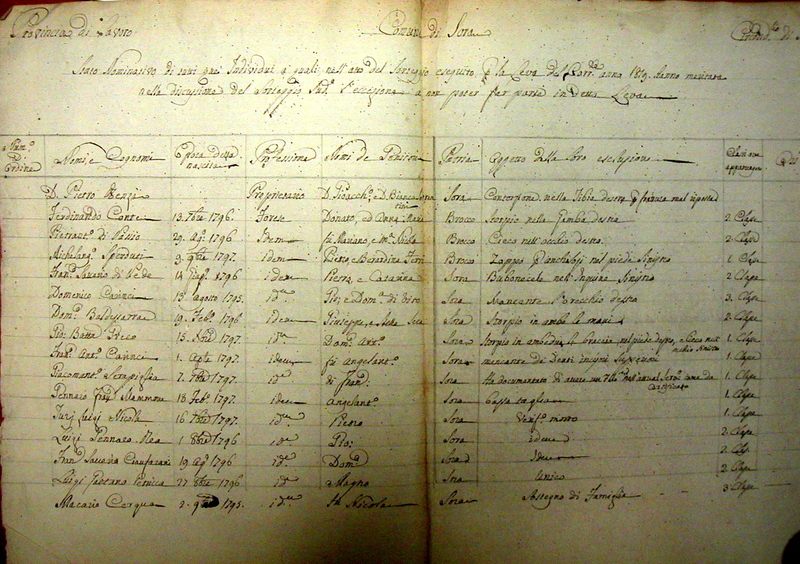 Military records for conscription soldiers are kept usually in the Archivio di Stato of the Province where the soldier was born. (l’Aquila, Teramo, Campobasso etc). For newer provinces (created after 1923) the old province has the records, for example the province of Pescara has military records depending on the place in Teramo or Chieti, Isernia is in Campobasso, Frosinone is in Caserta. For career officers, archives are kept in other places, usually one archive for each region, for Abruzzo they are in Chieti, for Molise officers are in Caserta. The Archivio di Stato in Frosinone are currently indexing the Foglio Matricolare stored in their facility. This will be of great benefit to those seeking copies. One should remember that a Foglio Matricolare exists only for those who served in the military or were actively called to serve. When there is no foglio, a check should be done of the Lista di Leva where the name, place and date of birth can be found. 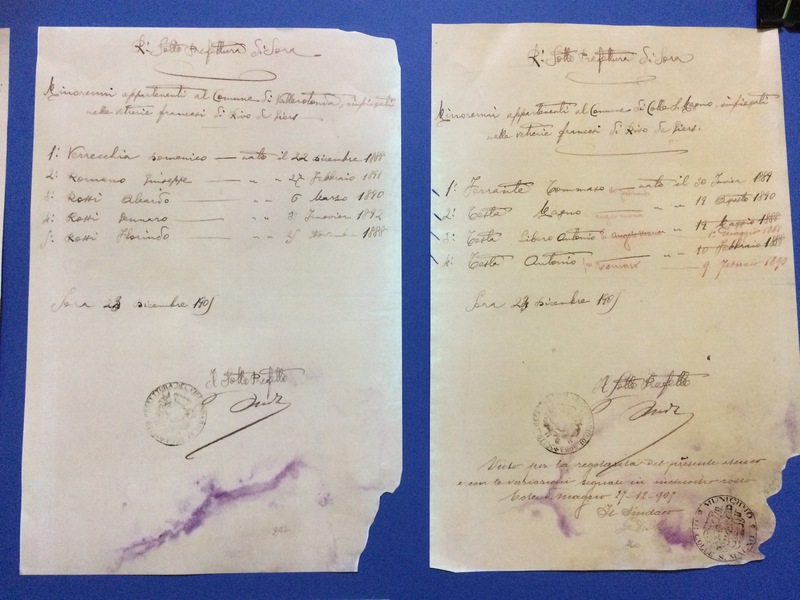 Also for the Archivio di Stato in Frosinone it should be noted that some of the Foglio matricolare for their area were sent to the Archivio di Stato in Latina and vice versa. For Latina the Foglio may also be found in Rome or Caserta. During WW1 a small number of minors were permitted to serve in the military. At a recent exhibition in Sora, on the 100th anniversary of WW1 documents were displayed that indicated the names of minors serving from various surrounding towns. Since civil records were lost in WW2 in some of these towns this resource could prove valuable for citizenship requests as an alternative document. ← Black Friday in LAZIO! 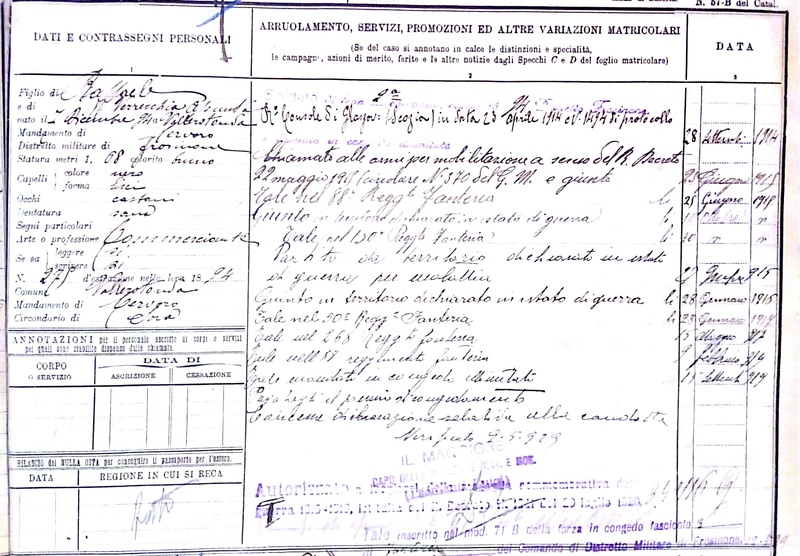 But where would you write if your ancestor was in the Bersaglieri from ca 1868 -1998? Many told me to write different places, like the “Archivio di Stato di Siracusa.” I did that, but they never responded. I also tried to contact someone via the Bersaglieri & IT Military sites. One person said he’d pass on my info to another in charge, but I got no response from that either.